Set the Sous Vide Professional™ to 179°F / 82°C, with the rear pump flow switch closed and the front flow switch set to fully open. Make sure your cooking tank has approximately a 3-gallon capacity and is covered. In a blender, combine the egg yolks, milk, cream, sugar, vanilla bean seeds and salt (do not blend the vanilla pods). Blend on high speed for 15 to 30 seconds (this breaks up the chalazae on the egg yolks so you don’t need to strain the finished sauce). Pour the mixture into a vacuum bag, add the vanilla bean pod and vacuum seal the bag, removing as much air as you can. Once the target temperature of 179°F / 82°C is reached, place the bag in the circulating water bath. Cook for 15 to 20 minutes. Crème anglaise cooked for 15 minutes will be thin and will just coat a spoon; it will be thicker if cooked for 20 minutes. Avoid cooking longer than 25 minutes, as the crème anglaise can take on an “eggy” aroma, although it will not curdle. Remove the bag from the circulating water, wrap it in a kitchen towel and massage it for 2 to 3 minutes. If you omit this step, the crème anglaise will look lumpy. Place the bag in a cold water or ice bath to chill. For best results refrigerate overnight. Serve the crème anglaise with fresh fruit or freeze on the Anti-Griddle™. Optional: Prepare your Anti-Griddle™ by spraying a thin coat of olive oil or cooking spray onto the stainless cooktop. Wipe spray evenly with paper towel. Turn Anti-Griddle™ on. 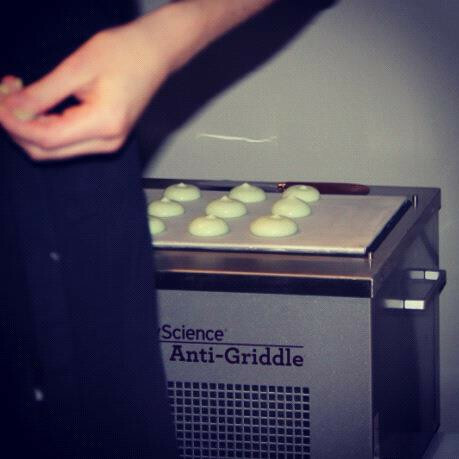 Optional: When Anti-Griddle™ surface has reached it’s coldest point, pipe or spoon crème anglaise onto the cooktop. Place a paper lollipop stick halfway across dollop. Allow bottow to freeze before attempting to flip, using a small, stainless offset spatula. Flip, if desired.